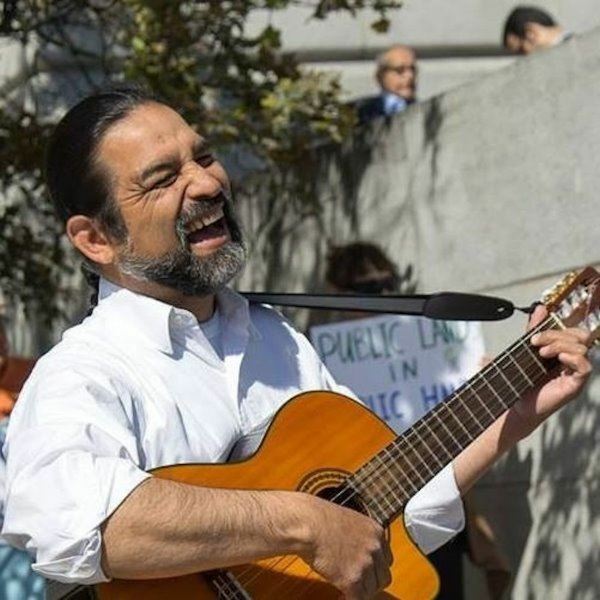 Theologian, cultural worker, singer-songwriter, and PMN Artist-in-Residence Francisco Herrera brings together different styles of music to promote human rights and social justice. Growing up in the border town of Calexico, California, Francisco always straddled two worlds, singing rancheras and some mariachi with his siblings and cousins at family parties, and starting some garage rock bands when they got older. As he became more involved in the church and social issues, in particular with Latin American issues, Francisco began exploring ways to use music to further his goals of social justice. Nowadays he sings in both Spanish and English with a sprinkling of indigenous languages. Francisco's music does not simply straddle the fence between cultures and influences; it brings them together to touch the heart and explore human desires for togetherness, simplicity, and the common good. PMN officially began our Artist in Residence Program in 2012. We've featured the following artists in this role: Si Kahn (2012); Emma's Revolution (2013), Magpie (2014), Kim and Reggie Harris (2015), Joe Jencks (2016), Fruit of Labor Singing Ensemble (January 2017), Jane Sapp (June 2017), Charlie King and Rick Burkhardt (2018), and Francisco Herrera (2019).